Elegant eighteenth-century villa completely restored and from which they were derived 18 rooms and apartments for 2 to 4 people. In a panoramic position between Pisa and Lucca, the villa offers its guests a large swimming pool with umbrellas and chairs, small wellness center with jacuzzi and sauna, large garden and parking. 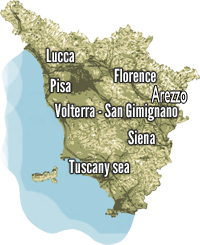 The Villa is easily accessible due to its proximity to the historical center of Lucca, at the exit of the motorway, train station and airport. For those arriving by car can make free use of a large car park for those arriving by public transport the bus stop is right in front of the hotel entrance. Apart from the rooms you can find 3 apartments for two, three or four people. They are suitable for both the couple and the family and are available for both short stays and long periods. All apartments are equipped with telephone, air conditioning, satellite TV, private bathroom, kitchenette in addition to traditional services. The rooms are all equipped with private bathrooms, air conditioning, television, telephone, and are reached by the wireless network. The restaurant offers seasonal dishes and tradition. Restaurant: The delicious dishes that go back to the traditional cuisine of the Maremma are mostly prepared with organic produce from the farm, among which the homemade pasta and game dishes.